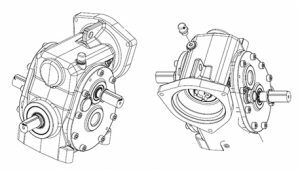 The Varvel Group can produce custom gearboxes to satisfy specific needs of all kinds in addition to its standard catalogue offering. Customization levels vary from simple modifications to standard gearboxes to the design of completely new products based on unique technical solutions, tailored to satisfy specific requirements and to solve specific problems. One excellent example of the high-technology service that Varvel offers is a special gearbox developed for a customer on the American market who produces automatic machines for indoor entertainment.